The following article is one I wrote for Edible Idaho for the Fall 2014 issue. Pedaling my bike uphill on a 90 degree day in September, pulling a trailer with 150 pounds of apples, I started to reconsider my “brilliant” plan. It seemed so simple, we’ll ride around the North End of Boise looking for apple trees. When we find one, we’ll knock on the door and ask if we can pick them. I hadn’t expected us to be this successful. Before moving to Boise, our family attended an annual community apple day celebration in Ironbridge, England. People would gather apples from all over the county. Local experts would identify as many varieties as they could. People could try dozens of different types and compare the flavors, but the real fun came when it was time to juice them. The community would gather several tons of apples and before you can press them, they must be scratted, or broken into smaller pieces. 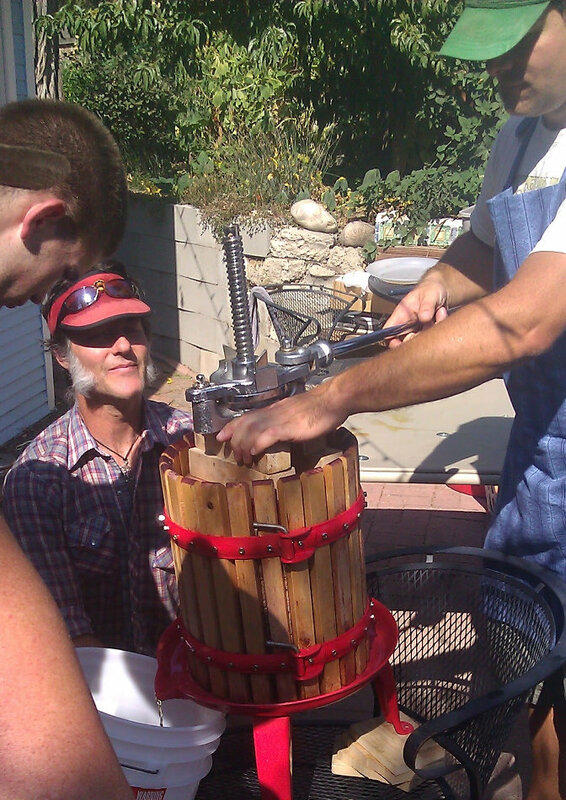 To get through the apples quickly, we used a wood chipper then pressed them with a hand-made wooden press that was taller than a person and took four adults to turn. The juice streamed out of the press and each pressing tasted different. It was always a highlight of our Fall. Unable to find a similar event in Boise, we decided to host one. All we needed was a press, a scratter and some apples. How hard could that be? Although one family coming to the event had a press, I wanted to try making one. Looking around the house, I found some scrap 2x4s to build a frame and a spare car jack to act as the press. 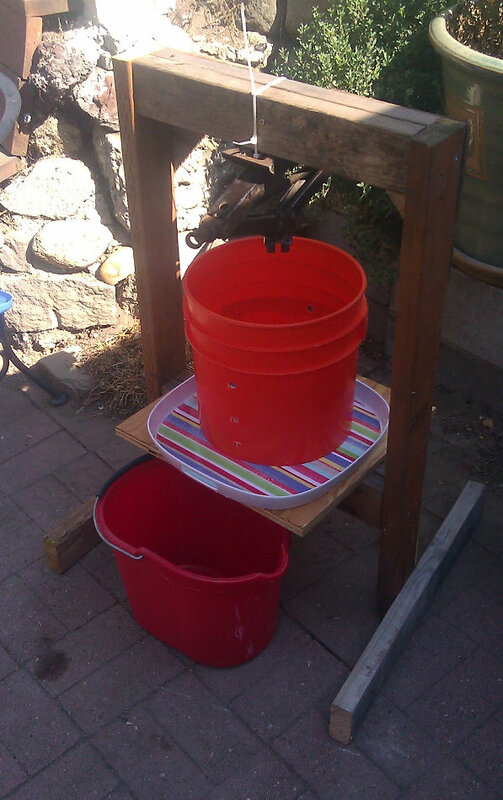 I combine those with some cutting boards from the Youth Ranch and a plastic bucket and the press was almost ready. All we had to do was clean and sterilize the parts that would touch the apples. Next we needed a scratter to break the apples apart before putting them in the press. I found that we could rent one, so I tried it out. 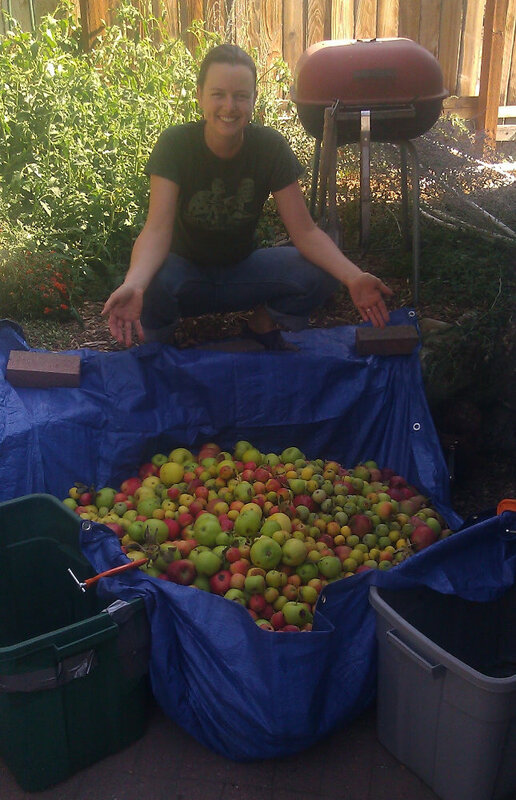 After only a few pounds of apples, my arm started to ache. I longed for the wood chipper we used to use. Looking around for anything that would accelerate the process, I realized a garbage disposal did almost exactly the same thing. A look of disgust from my wife told me building the scratter with a used disposal was not an option. A quick trip to the hardware store to buy a new disposal and we were ready for the apples. We decided it was too nice a day to drive, so we opted for bikes. Besides, bikes moved slower giving us more time to look for apple trees. I pulled out my bike and trailer and we headed for the East End. We spotted the first tree and as I approached the door to ask permission to pick apples, the audacity of my request struck me. I was walking up to strangers’ homes to ask if I could have food that was growing in their yard. After a brief moment of panic, I knocked. They gave me an odd look when I explained what I was doing, but were happy to have me collect their apples. They even apologized for not spraying the trees with insecticide. Success! We rode around the East End, then moved on to the North End. As the day heated up, the trailer got heavier and the bike got harder to move until finally, I couldn’t pedal up the slight incline to Hill Rd. Laughing at the unbelievable luck we had collecting apples, we decided to drop off this load and go out again. 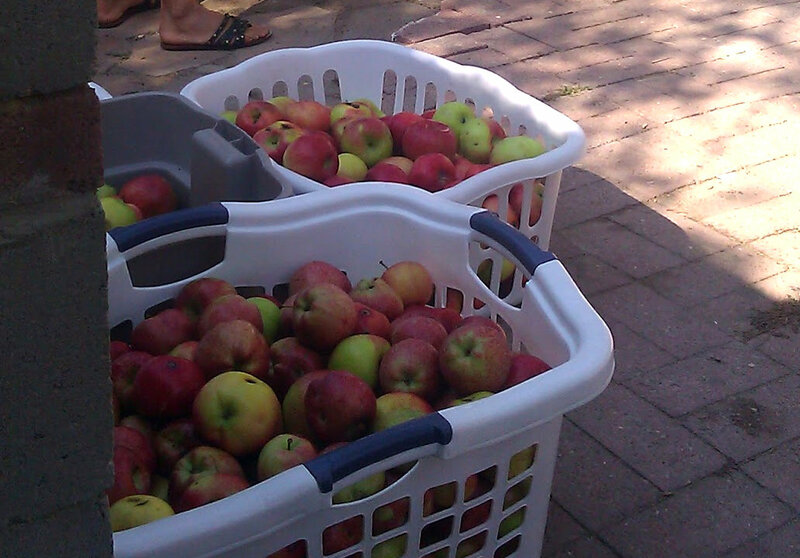 In total, we collected over 300 pounds of apples including at least a dozen varieties. Pressing day arrived with three presses, two scratters and friends adding their apples to our collection. In the cool Fall morning, we started cleaning and scratting apples, pausing often to sample the different types. It was amazing to taste the diversity, even within a single variety. Some sweet and juicy, almost bursting as we bit into them. Others dry and tart enough to make us squint. We mixed the flavors and piled it into the press. The juice began to flow. By the day’s end, we had over 25 gallons of juice, one broken scratter and two broken presses. The 2x4s and car jack was the only press left working. I also learned that garbage disposals don’t like to operate dry. It overheated and shut down. Once we started running apple juice through it to keep it cool, it ran fine the rest of the day. We divided the juice and froze some. More was fermented into the best cider we had tried, but the most popular use was in apple molasses. We boiled seven gallons down to one. What was left made the most amazing spread for toast in the morning, went great in whiskey in the evening and was devine over vanilla ice cream anytime. The inaugural Boise Apple Day was a wonderful event. 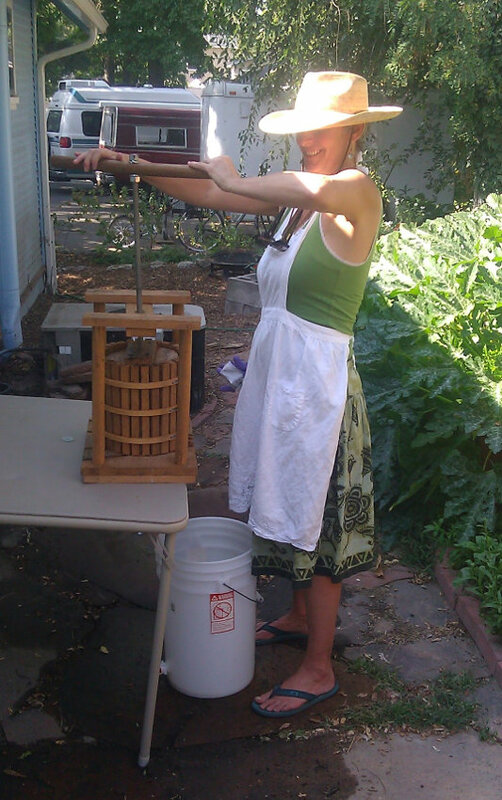 I can’t wait to collect more apples this year and I’ve already started redesigning my press to make it even better. This entry was posted in Other Writing and tagged Apples, Cider, Cider Press, Community, England. Bookmark the permalink. Good luck with the 2nd annual Woody! It’s great to read your writing again! Thanks, Rod. It’s been an unusual summer which has left surprising little time to write. Hopefully things will calm down a bit now and I’ll be able to get back to writing. You two have inspired me to try and get something like this going on Bainbridge! I knew it had been a success last year but this was a great write-up. Thanks!